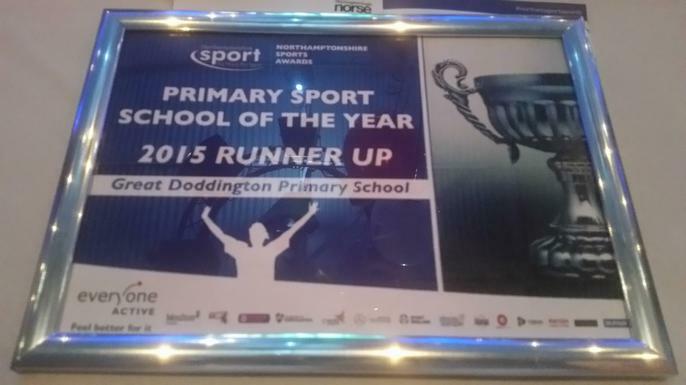 Last week, we were all hugely proud to be awarded Runner-Up in the Northamptonshire Sports Awards 'Primary Sport School of the Year' category. Mrs Chapman, Mr Gunn, Miss Shelton & Mrs Parsons all attended the glittering awards ceremony, with prizes presented by Mike Sewell from BBC Radio 5 Live, and finishing in second place from every primary school in the whole county is a fantastic achievement. Our success is down to all the children who enter tournaments and the success we've had in competitions where we regularly outperform much bigger schools. Congratulations to Lings Primary in Northampton, who were this year's overall winners. Maybe next year.